One of the most popular events at the Fort Worth Stock Show and Rodeo is the cowboy mounted shooting championship which took place Wednesday. 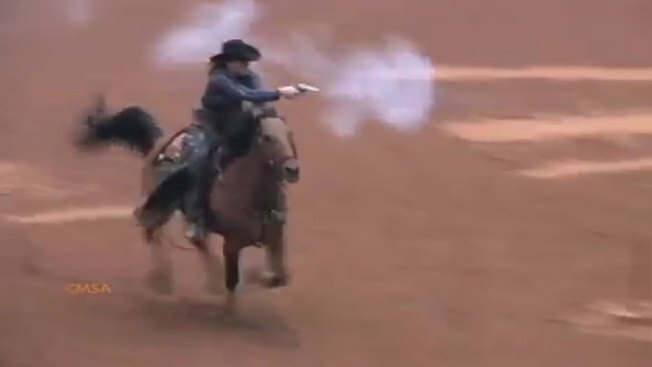 "Cowboy mounted shooting is a combination or rider skill and a great horse," said Annie Bianco, the national spokesman for the Cowboy Mounted Shooting Association. "The horse has to maneuver through all the targets." This sport has been around for 20 years. Bianco says today the number of men and woman who participate in the sport is about 50/50. "I have been doing cowboy mounted shooting for 17 years," said Bianco. "I was one of the first women involved with the sport, I have traveled all over the country and the world promoting mounted shooting." Bianco says not all horses are great for this sport. Some are very spooked by the gun fire, while others do not mind it. Bianco says spectators do not need to worry about being shot. "No we are shooting black powder," said Bianco. "It actually goes 15-feet then it dissipates." The fastest time wins. The champion at this competition wins a grand prize of $10,000.